WHERE IS A MERCY FOR DUCKS AND GEESE? Every new day on this Planet shows us all the ignorance of humankind, all over again. The endless egoism and the deep corruption of the human souls have created the chaos on the Earth, destroyed the beautiful wildlife and endangered the ecosystem. The circle of life seems to be an exclusive right only for greedy people but not for other Earthlings, especially not for innocent animals. I believe that all evil deeds what we have done as a human race to all fellows is something that won’t be forgotten and forgiven for eternity. We have shown that homo sapiens was the best joke ever and we keep confirming the theory that human beings are the worst parasites that have ever existed. 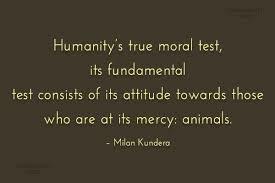 The animal cruelty and animal abuse are the daily horror that is happening worldwide, without any consequences. If you kill another person, you are supposed to be processed and you are condemned. 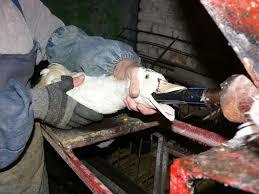 Killing animals for a pleasure of sport or sadistic gastronomy, looks like a normal thing for majority of humans. Some of them will always find an excuse in their sick religions or cults and some will try to explain that is the privilege of superior species, to kill everything and everyone that is weak or weaker. They all forget one very important thing: the strong do not need a violence to survive. Only weak with power will try to achieve violence because they are frustrated because of the lack of real strength. The worldwide population is a failed project of the intelligence, bodies without common sense, hearts without compassions, losers without ethics. French people are known to be the worldwide consumers No.1 of this delicacy but even in France, people who have seen the tragedy of animals are deciding to stop it and to be involved in the campaign against this terror. In France, this has been a tradition for many years and still French farmers are fighting to keep on this practice, justifying it with needs of human to have animals as food. That is only a cheap lie. First of all, animals don’t belong to us so we can abuse them for our unethical intentions. They have right to be on this Planet as much as we do and to live in freedom, without being terrorised and exploited from so called human beings. Second but not less important, the tradition could be changed and adjusted to the modern world and options we have and we can choose to be ethical towards our environment and other sentiment living beings. When someone is holding on tradition, I would like to ask him or her, why then they use a modern technology ? That has nothing to do with tradition and backward system. 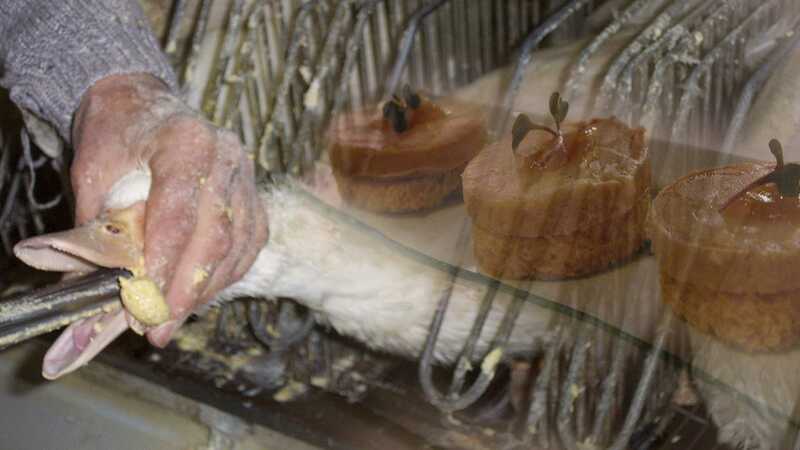 After many animal right activists have exposed the secret tortures on some of the French farms, almost 50% of French have stood up against foie gras and almost 77% have suggested to find some another way of preparing foie gras but excluding forced feeding of poor birds. The people need to witness the pain and then they change their lucky life and get rid of their pink glasses. 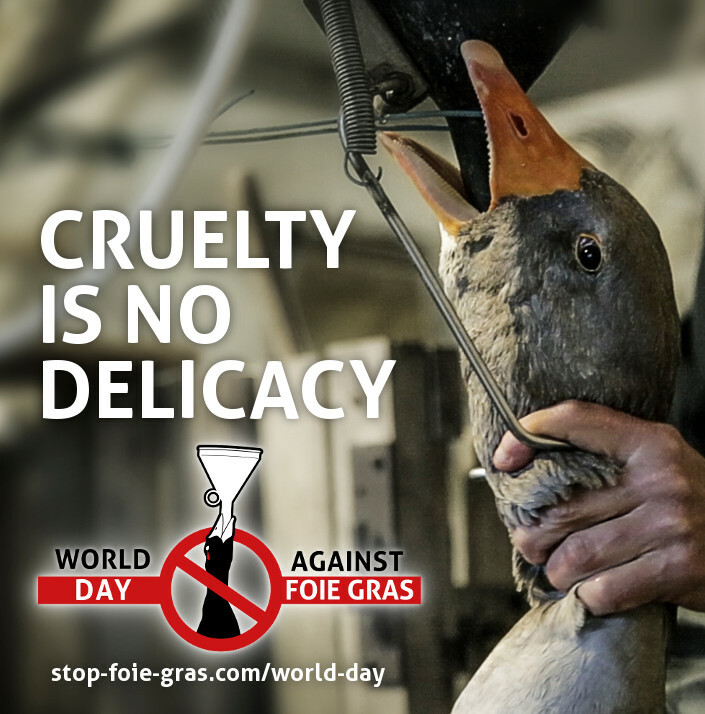 One coward and psychopath can think of foie gras after seeing the documentary about terrified ducks and geese on some of the farms that are known to be included in the business of foie gras sale worldwide. The good thing is that some countries, like the UK, Germany, Norway, Sweden, Israel and U.S. State of California, have already banned the production of foie gras. This only means that the common awareness of this problem as a threat to animal welfare has been enough presented and elaborated in public and the society has decided to send it in history, as an act of barbaric behaviour and cruelty. The main problem is that some farms and companies even think of moving their production in China and other countries, known to be a paradise for animal cruelty. For those companies, profit is everything and they do not care what is happening and how it is happening, as long as their turnover is in positive direction. The countries with zero respect for animals that are multiplication their population almost like parasites their colonies, are simply waiting for such regulations in high developed countries because they see it as a chance for their own local business, opened for everything. No ethics, no problems. In those lands is innocent animal or child nothing when we compare it to the expected profit at the end of the day. This primitive practice of French gastronomy has to be global condemned and so the people who are enjoying it. This has nothing to do with our progressed civilisation and the strategies of friendly environmental policy. If we want to give this world to the next generations, we have to defeat the demons of our time and the backward forces of the humanity. It doesn’t surprise the quality of public health and the rise of so many diseases that are reducing the life of humans, when we compare with the food we eat and its sources. The majority of people eat everything like their stomach is a landfill. The outcome is so expected, the all possible and impossible disorders are on the road, because the Homo sapiens has lost the ethic in his food. There is always a hope for a new beginning. It is never late. You can change your life if you change your habits. It is not only about being a healthier but also about being a more compassionate person that is taking care of the world you we live in and of the innocent and weak creatures that have right to live their short life, without being abused by people. 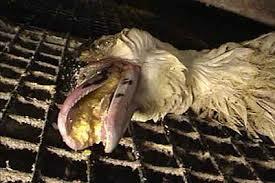 STOP FOIE GRAS, REPORT THE ABUSE, FIGHT IT BACK!NOW AND ALWAYS. HERE AND EVERYWHERE! This is a absolutely informative article!! I had no idea that this was going on and I support all efforts to stop it!! Well written Sarah!! Sarah’s invaluable and imperative article reminded me of the evolution of The Royal Society for the Prevention of Cruelty to Animals (RSPCA): Enlightenment Age intellectuals of England (men and women) were debating the use and treatment of domesticated and wild animals across Britain, during the early-1800s. Obviously, not an easy undertaking to convince farmers, etc., to mend their ways: there was an unsuccessful attempt in 1800 to pass legislation to ban the practice of bull-baiting. In 1809, Lord Erskine (1750–1823) introduced an anti-cruelty bill which was passed in The House of Lords, but was defeated in a vote in The House of Commons. In 1822, an attempt to pass anti-cruelty legislation for cattle became law. The very first meeting of what would becomes the RSPCA was held in 1824, at Old Slaughterhouse Coffee Shop, ironically. At this meeting, an organisation was founded as ‘The Society for the Prevention of Cruelty to Animals’ (SPCA). The SPCA was the first animal welfare charity to be founded in the world. In 1824, it brought 63 offenders before the criminal courts. It was granted its Royal status by Queen Victoria I in 1840; becoming ‘The Royal Society for the Prevention of Cruelty to Animals’ (RSPCA). The technique of gavage (i.e. forced-feeding) dates as far back as 2500 BCE, when the ancient Egyptians began keeping birds for food and deliberately-fattened the birds through force-feeding. 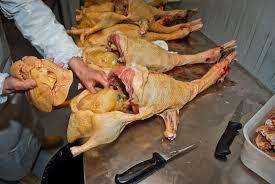 The practice of goose fattening spread from Egypt to the northern Mediterranean Sea coast. 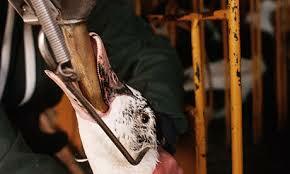 Presently, a number of countries and jurisdictions have laws against force-feeding, and the production, import or sale of foie gras: even where it is legal, a number of retailers decline to stock it. In 2018, an Ipsos MORIs (i.e. a market research company) poll found that 63% of adults in Britain would like to see a complete ban on the sale of foie gras, in Britain. Thank you, Sarah, for this educational and informative article, albeit a sad one ! 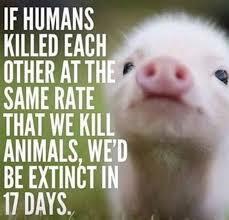 Humans lack of intelligence is only surpassed by the Evil in them ! So many cultures claim to do so many evil things in the name of tradition. 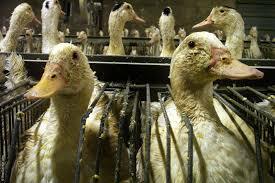 In this article, it’s about Foie Gras and the French culture. In one of your previous articles, it was about Bullfighting/Corrida and the Spanish culture ! shame on any culture that claims that Evil must befall poor and innocent animals in the name of tradition ! I totally concur with you, Sarah, as to the fact that those same cultures should then give up new technology, as it is not part of their “tradition’ ! Homo sapiens have just proven that they are “homo idiotus” more than anything else ! It’s time for all countries to condemn such Evil practice to condemn the countries that still practice it ! Thank you again, Sarah, for all your dedication to the the Animal-Welfare cause, for being the voice of the voiceless, for helping the helpless, and for defending the defenseless !